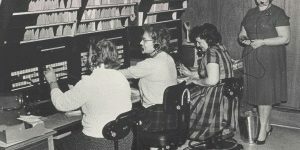 Edwards Answering Service celebrates its 65th anniversary on April 1. Telecommunications technology has come a long way since the rotary phone days. Hard drives and backup systems guarantee that customer calls never go unanswered, while an uninterrupted power supply with a large capacity gas-line fueled generator allowing staff at Edwards HQ to remain fully operational even during the worst weather. The company’s signature customer service, however, remains the same as when Betty Edwards fielded her very first phone call from her dining room. Edwards Answering Service has been helping Charter Painting & Restoration by answering phones and providing voicemail services since 1967. Owner Jim Charter says the call center has been instrumental in his company’s own longevity. The Manchester, CT-based painting and restoration business will celebrate a landmark 50 years in 2019. Most importantly, Edwards Answering Service afforded Jim and his family privacy at home and allowed him to keep his home life and his business life separate. Messages were consistently accurate, he notes, operators were receptive and respectful, and potential customers were provided with a reliable overview of his business. In more than six decades of operation, Edwards Answering Service has never shut its doors, says Human Resources Manager and “Edwards Mom” Tammy Cosper. Not only is Edwards Answering Service dedicated to its customers, but it is dedicated to its employees. Edwards’ “all for one” commitment to providing exceptional customer service remains as important today as it was 65 years ago. It’s as important as it was in 1963 when Edwards moved into the building that continues to serve as its home in 2019. And it’s as important as it was when Gary officially joined the company in 1980, when he and his mother formed an enduring partnership that would take the answering service industry by storm. With the advent of call forwarding, Gary and Betty Edwards took great pains to grow the company and break into new markets. When Gary opened his own answering service office in Milford, CT, Edwards Answering Service took its first steps into expansion, and when he later merged a Guilford, CT enterprise he had purchased and operated – Edwards became a true force to be reckoned with. Gary credits this proactive nature for much of the company’s success. The Edwards Answering Service team’s cumulative knowledge and credentials offer businesses of all shapes and sizes peace of mind that their calls are in good hands, and live phone operators help industries from real estate to medical practices manage their accounts 24 hours a day, 7 days a week, 365 days per year. According to Gary, there are no plans to hang it all up any time soon. For more information, visit www.edwardsansweringservice.com. “Andrews Oil & Gas Services began using Edwards Answering Service in 1967! WOW! Wonderful company with employees to match. They have always been professional, efficient and friendly. We would highly recommend Edwards Answering Service for those looking for a reputable 24-hour answering service company. Our preference is always to support local, family owned businesses…just like us! Does Your Business Need a Call Answering Service?